Could the 2016 Team USA roster hang with the Dream Team? WhatIfSports.com simulated a matchup between the 2016 U.S. Olympic men's basketball team and the 1992 Dream Team. 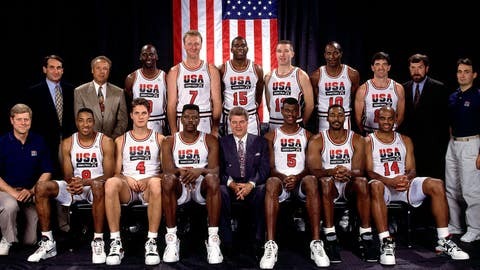 There is one ritual that began in 1996 and has continued to occur leading up to every Summer Olympics since: comparing the current men’s basketball team to the 1992 Dream Team. It’s an unfair measuring stick for even the most loaded squad, given how stacked the Dream Team was. The 12-man roster included 10 of the NBA’s top 50 players of all time, as voted in 1996 as part of the league’s 50th anniversary. Those players were Charles Barkley, Larry Bird, Clyde Drexler, Patrick Ewing, Magic Johnson, Michael Jordan, Karl Malone, Scottie Pippen, David Robinson and John Stockton. Only two Dream Teamers, Hall-of-Famer Chris Mullin and Christian Laettner, a recent Duke grad who had yet to play professionally in the summer of 1992, weren’t honored as top 50 players. Disagree with the depth charts? Simulate the matchup yourself and select "Edit Depth Chart" to create your own lineup. The Dream Team won 694 of the 1,001 matchups, outscoring the 2016 team by an average score of 109.1-101.8. One advantage the Dream Team leveraged in the simulation was its superior low post size and depth. Barkley and Malone spilt time at power forward, with Ewing and Robinson manning the middle, plus some Laettner thrown in for good measure. The closest thing the 2016 team has to a true "four" is Green, with Anthony and Durant likely to see time at the position as well. DeAndre Jordan and Cousins are no slouches at center, but would be a little outmatched against Ewing and Robinson. The Dream Team commanded a +10.0 rebounding advantage against their younger brethren and shot 50.4 percent from the floor, compared to 44.7 percent for the 2016 team. One area that helped the youngsters close the gap was three-point shooting. The 2016 team let it fly from deep 25.5 times per game, connecting on an average of 9.2 triples (36.2 percent). The Dream Team attempted fewer three-pointers than the 2016 team made, shooting just 8.6 threes per game with 2.7 makes (31.7 percent). Leading the way for the 2016 team was Klay Thompson (1.6 3PM, 42.3 percent), while Clyde Drexler (0.6 3PM, 34.4 percent) did the most damage from behind the arc for the Dream Team. Visit WhatIfSports.com to build your own Dream Team.